YstokReport is a report definition and generation framework. The library is Lisp implementation-specific and targeted at LispWorks®, a Common Lisp development system for Macintosh, Windows, and Linux platforms. It is based on CAPI and does not require any DLL or OLE components. 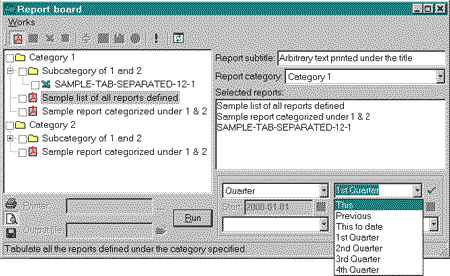 Report board, a main CAPI interface for the end-user to navigate and run reports. PDF documents are generated by means of cl-pdf/cl-typesetting (fractalconcept.com). With YstokReport, the user can print out reports or preview them in the Adobe Acrobat, Adobe AcroReader, or another PDF viewer. On Windows, a fine-tuned control over the Acrobat or AcroReader is provided by means of the LispWorks DDE API. Macros exported from the ystok.report package allow the user to define a category hierarchy as well as specific report types and functions. :title "Sample report categorized under 1 & 2"
We usually provide our customers who program in Lisp with the source code of YstokReport under a special license agreement. saving and restoring the history of values of input parameters, the whole history is retained in one session is restored in the next working session. The ex1.lisp sample file was used to produce this report.